You're a hero in an organization that expects you to get things done; wouldn't it be nice to call on them when you need help? Now you can. 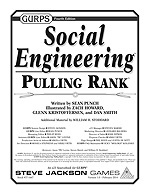 With GURPS Social Engineering: Pulling Rank, you'll be using the GURPS Rank advantage to get you out of jams like never before. Building off ideas first presented in GURPS Social Engineering (which is useful but not required), this supplement lets you use your sway within the org to order up aid: get invited into places of interest, cut through bureaucracies, effect an official escape from bad situations, or call in an air strike. You can even ask for assistance when you don't know what would be useful! If you've got GURPS Social Engineering: Pulling Rank, you've got an ace up your sleeve that's even cooler and more versatile than a hidden firearm.